More than a decade after his death, John Cassavetes still does not enjoy the reputation he deserves, as Peter Bogdanovich describes, "the most dazzling maverick American picture-maker since Orson Welles." Film writer Tom Charity decided it was time to do something about it. In the Introduction to his new book, "John Cassavetes: Lifeworks" ($19.95, Omnibus Press), Charity complains about the lack of available books on Cassavetes. He describes contacting Cassavetes' widow, the actress Gena Rowlands about this. Rowlands expressed her regret that she was not able to talk about Cassavetes, per his own wishes. "He wanted his work only to speak for him," she told Charity. So Charity took that ball and ran with it. 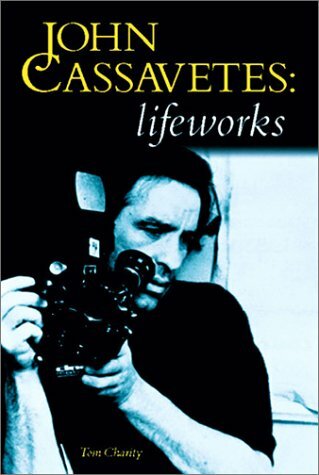 "Lifeworks" takes Cassavetes' twelve feature films and dissects them, chapter by chapter. Beginning with a brief chapter on Cassavetes' youth, he then delves into the making of the films and the various stages thereof, descriptions and analyses of their plots, and their critical and box office receptions. Cassavetes' first film, Shadows (1959), is considered to be a landmark of American cinema, chosen to reside in the Library of Congress' National Film Registry, and a film that Martin Scorsese continually cites as an influence. Charity explores the history behind that film's mythical first incarnation, a shorter, more improvised version that does not exist anymore. Cassavetes scrapped and re-shot the entire film, using only about a third of the original, and writing actual scenes and dialogue for the rest. When the film ends with the title card, "The film you have just seen was an improvisation," it's being more than a little facetious. Charity's passion in "Lifeworks" is clear, but he stealthily avoids the trap of hero worship, making no apologies for Cassavetes' lesser-to-failed films like Too Late Blues, A Child Is Waiting, Gloria, and Big Trouble. He also wisely gathers testimony from working filmmakers, including Bogdanovich, Pedro Almodovar, Olivier Assayas, Jim Jarmusch, Gary Oldman, and John Sayles, all of whom pay homage in their own words to Cassavetes' genius. Though Cassavetes slowly evolved into a movie star, especially after acting in such huge hits as The Dirty Dozen (1967) (for which he was nominated for an Oscar) and Rosemary's Baby (1968), Charity makes it clear that he hated these compromises, and, like Welles, only did it for money to fund his own films. Though this idea may seem like a huge cliché, Charity makes it stick by painting Cassavetes as an enthusiastic artist bent on devouring life and everything in it. He simply didn't have time to waste on Hollywood eye-candy. Ironically, he adored Don Siegel, who directed him in the Lee Marvin crime movie The Killers (1964). To Cassavetes, Siegel was unpretentious and as close to life-like as film directors came. An early story describes Cassavetes as he joined his first acting class. Students arriving before him changed their names for simplicity's sake, like so many movie stars (Edward G. Robinson, Kirk Douglas, Lauren Bacall) before them had. As Cassavetes arrives, a registrar tells him, as she told several students before him, that his name is too long and too hard to spell and too hard to say, and that he ought to change it. But Cassavetes simply looked at her and said, "they'll learn." With the help of Charity's excellent book, perhaps the rest of us will learn as well.